Homeowners removing switches to decorate behind or changing socket covers may seem harmless, but actually it could have consequences if the integrity of the circuit is not tested before and after. Both MK Electric and Click offer a screwless range which tackle this problem, and make updating your sockets and decorating behind your switches safe and simple. How do screwless switches and sockets work? The screwless design comes in two separate parts; a functional module with support frame and a front plate that clips onto the module hiding screws and removing access to wiring. Customers will gain complete flexibility, meaning they can switch the front plate design at any time if damaged or even remove the front plate temporarily, all without tampering or dealing with the cables. To remove the front plate, homeowners don’t need any electrical knowledge, as the front plates simply pop off using a screwdriver. For installers, the functional module unit is simple to install and wire up, removing any worry about damaging the front plate during installations or during a messy build. Homeowners can then clip on the front plate afterwards, not delaying any install time. Both Click and MK Electric don’t compromise on looks either, with either a black or white back plate, and a variety of finished front plates available, designed to integrate into your home seamlessly. How safe are screwless sockets and switches? They are a safer alternative as many homeowners will change socket fronts and not safely isolate or check the wiring before removing the socket completely. 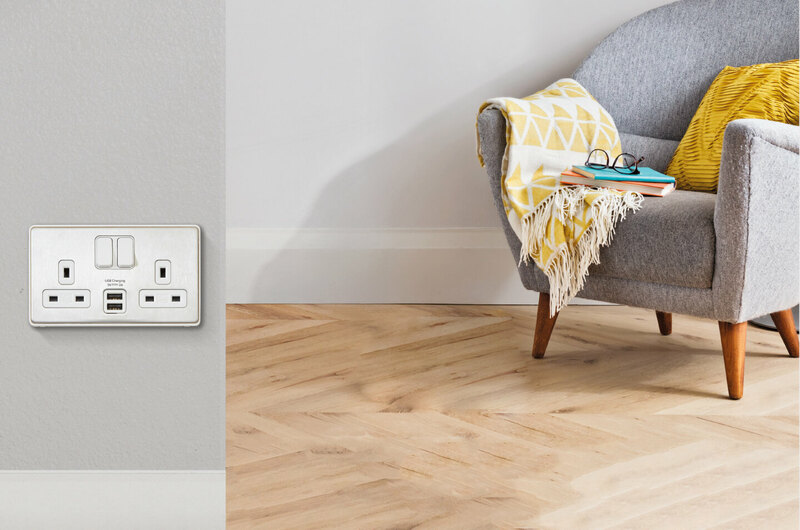 Both brands’ socket fronts simply click into place or pop off easily, meaning no need to call out an electrician for advice or help with removal. The screwless 13A sockets also meet the current British standards, by operating a 3 pin shutter system, making them safe for children as they block access to live electricity terminals. Both Click and MK Electric come with a 20 year guarantee as well. The only difference between the MK Electric Dimensions and the Click Definity ranges is the price and brand name. MK Electric’s new Screwless Dimensions range is available from November 2017. Prices are yet to be released, however we estimate they will be in the region of £20-30 for a brushed chrome double gang 13A socket functional module back plate and front plate (this is based on prices for their current MK Aspect Screwless range). Click Definity Screwless range is available to buy now from CEF and various wholesalers, with prices starting from £5 for a double gang 13A functional module in either black or white and £1.88 for a white front plate and £6.25 for a brushed chrome front plate. Both ranges offer everything from switches, to sockets, to shaver units, to dimmers in a variety of sleek metallic and synthetic finishes. However, Click Definity is the more affordable option if upgrading your whole home, whereas, costs for MK Electric Aspect can add up quickly for a complete upgrade. With the ease of upgrading and reduced risk of damage during installs, screwless wiring solutions are sure to become a popular choice amongst installers and customers. You can buy the Click Definity range right now from CEF and other various online retailers. MK Electrics Screwless Solutions is available from November 2017.